Figure 9.3. Specific examples of Earth vs. ship times. The value of the hyperbolic tangent approaches 1 as the value of the hyperbolic arc cosine approaches infinity. So in this solution objects never reach light speed unless their acceleration is also infinite. Said otherwise, reaching light speed requires reaching also infinitely large kinetic energy, because V/c tends to 1 and the Lorentz transformation factor (the square root at the denominator) tends to infinity. In Section 8.3 we have seen this is the result of the fact that potential energy grows with the Lorentz transformation factor (1 — V2/c2)—1/2. However, the hyperbolic tangent has a value of 0.9999, or V is only 0.01% less (30km/s less) than light speed when the value of the hyperbolic arc cosine function is 70.7. So the ''V/c k 1'' curve on Figure 9.4 represents actually 0.9999 of light speed. Figure 9.4. Flight profile and differences between crew and Earth times. velocity approaches light speed. The spacecraft crew time (broken line) breaks away from the Earth observer line above some acceleration threshold. 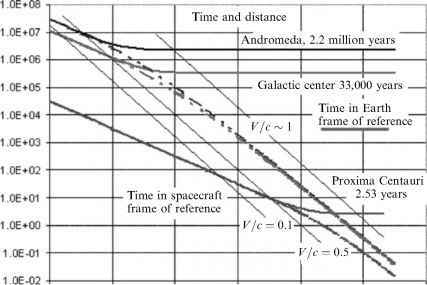 The greater the distance, the lower the value where the spacecraft/crew perceived acceleration curve breaks away from the Earth observer line. For the nearby Alpha Centauri star the observer and the spacecraft crew time curves are relatively close until almost 1 "g" acceleration (9.8067 m/s2). For the two more distant destinations, and for practical accelerations, there are orders-of-magnitude differences between Earth and crew times. One of the many problems with interstellar travel is the different times predicted between non-inertial frames by Special Relativity. Note again that in these calculations the effect on times due to the non-inertial frames of reference when the ship accelerates and even inverts its velocity have been neglected (see [Boniolo, 1997]). The ship time to the nearest star (4.3 light-years) is about 58% of Earth time. The difference is not sufficient to terribly disconcert the arriving crew: the Earth team perceives the trip as 1.86 years longer than the crew. However, as the distance and acceleration increases to reach the center of the Milky Way (about 33,000 light-years), the discrepancy in clocks is startling. The ship clock has only registered 24.7 years, while on Earth 30,000 years have gone by. That is more distant to the future than the past Ice Age is to the present! 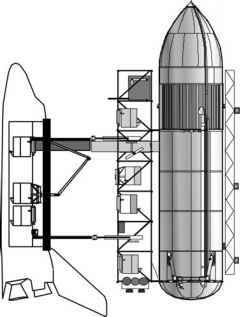 The crew would have no concept of what to expect when returning, and there would be probably no chance of any communication with anything or anyone on Earth. Moving to the nearest spiral galaxy (2.2 million light-years) the clock on the spacecraft would have only registered 28.3 years, while the Earth clock would have registered 2.2 million years. That is about the time in the past the first human-like beings appeared on Earth. So how we address the different clock rates, so that deep-space exploration can be managed by Earth-based mission teams within their 20 years or so of professional life, is a very good question for long interstellar travel. Whether the spacecraft is manned or robotic, for distant space destinations there would be no one on Earth that knew what was returning to Earth, or why. Putting aside the effects of the Theory of Special Relativity on clocks, it is worth mentioning the root of the problem, that is, the definition of time or, more correctly, of passing time. Humans perceive the present moment as having special significance. As the clock ticks, one moment passes and another comes into existence, and we call the process the flow of time. Researchers, however, argue that there is no special moment, not even the "present", that is any more special than any other moment. Objectively, past, present, and future must be equally real (physicists talk about "absolute past" and "absolute future" in Minkowski's space-time, see [Miller, 1981; Boniolo, 1997]. That is, all of eternity is laid out in a four-dimensional domain composed of time and three spatial dimensions. What is observed as the passage of time is actually that earlier states of the world are different from earlier states of the world we remember. "The fact that we remember the past, rather than the future, is an observation not of the passage of time but of the asymmetry of time—a clock measures duration between events much as a measuring tape measures distances between places; it does not measure the "speed" with which one moment succeeds another. Therefore, it appears that the flow of time is subjective, not objective'' [Davies, 2002]. The question of a time arrow is a major one and is related to the fact that in any isolated system entropy cannot decrease. All the fundamental equations of physics hold irrespective of the time direction, but, in our Universe at least, time seems to be flowing only in one. This troubling issue may be resolved by admitting the existence of a "multiverse", a structure composed of many universes, where each has its own time arrow [Carroll, 2008]. In such a multiverse time may flow statistically either way, so that there is no preferential direction. In a special issue of Scientific American [Scientific American, 2002] the main topic is ''A Matter of Time''. Davies [Davies, 2002] provides an example of that in "What time is right now?'' An Earthling in Houston and a person on a spacecraft crossing our Solar System at 80% of the speed of light attempt to answer the question: "What is happening on Mars right now?'' A resident of Mars has agreed to eat lunch when the clock on Mars reads 12:00 p.m. and transmit a signal at the same time. Earthling and Martian exchange light signals and determine the distance between them is 20 light-minutes and synchronize clocks. Spaceman and Martian exchange light signals and determine the distance between them is 12 light-minutes and synchronize clocks. Earthling assumes Martian has begun to eat lunch, and prepares to wait 20 minutes for verification. Spaceman hypothesizes Martian has begun to eat lunch, and prepares to wait 12 minutes for verification. Signal arrives disproving hypothesis; spaceman infers Martian began eating lunch before noon. Knowing spacecraft's speed Earthling deduces spaceman has encountered the light signal on its way to Mars. Spaceship arrives at Mars and spaceman and Martian notice that their two clocks are out of sync, but disagree as whose is correct. Signal arrives at Earth. The Earthling has confirmed the hypothesis that noon on Mars is noon on Earth. Signal arrives at Earth. The clock discrepancies demonstrate that there is no universal present moment. Figure 9.5. What time is on Mars? (Adapted from [Davies, 2002]). theory itself, as if time were not a physical variable of interest [DeWitt, 2003]. This is also the opinion of the physicist Julian Barbour [Lemonick, 2001], who is convinced that time is an illusion created by our brain, an idea put forward by Fred Hoyle in one of his fiction books (The Black Cloud) in the 1960s and also mentioned by Gribbin [Gribbin, 1992, Ch. 7]. The question of quantum gravitation may have a profound influence not only on understanding our Universe's architecture, but also on space travel. A recent suggestion [Ambjorn et al., 2008] posits that the structure of the Universe may be constructed with simple building blocks or elements (so-called "simplices") by what we already know (gravitation and quantum mechanics, using the principle of superposition), provided the principle of causality is added. This constraint means time must flow in the same direction for neighbor simplices. This suggestion is being implemented by its authors in a comprehensive theory that allegedly predicts some of the key features of our Universe, including Einstein's cosmological constant now back in fashion to explain dark energy. If this theory can be validated, a consequence is that wormholes (one of the most used travel devices invented by science fiction writers) may not exist: the structure of our Universe would in fact be very smooth (i.e., maintaining the same concept of distance between two points we are familiar with—no "wormhole" shortcuts). As we shall see, the way out of this quandary is to travel in another non-time dimension, if such a postulated dimension exists. If the space-time continuum is more than four-dimensional (i.e., made of three space coordinates and time), there is a way to reach the most distant star and galaxies in less than human lifetimes. These equations have a kind of counterpart in the transonic drag equations of aerodynamics predicting infinite drag at Mach number 1; this result worried physicists after World War II, but in fact was due to linearization of the equations themselves. Some might doubt whether relativistic effects are the result of a discontinuity due to a similar mathematical treatment, or are a true physical discontinuity when V = c. Calculation of the mass ratio needed to accelerate near the speed of light yields inordinately high values, just as evaluating drag with linearized aerodynamics near Mach number 1 yields unrealistically high drag. To most physicists there is no question: because of the Michelson-Morley experiment and accurate measurements of time differences between satellite and Earth clocks, Special Relativity ''works''. However, some keep doubting, because the discontinuity when V = c seems a pure mathematical artefact, that is, the effect of the Lorentz transformations based on the invariance of c. Still almost all physicist are convinced of the validity of Special Relativity.